The U.S. Special Operations Command (SOCOM) has placed an order for militarized Toyota Land Cruisers, Hiluxes and Ford Rangers to use as low-profile but battle-survivable field vehicles. That’s provided the prototypes pass muster in military evaluations, of course. Defense contractor Battelle of Columbus, Ohio has been awarded up to $170 million to build “as many as 556 vehicles—396 armored and 160 unarmored—with most of them consisting of the Toyota Land Cruiser models 76 and 79,” Military Aerospace reports. 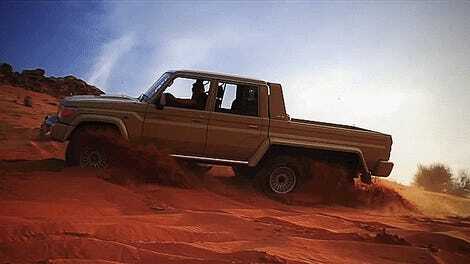 That would be the beloved and boxy “70 Series” in SUV and pickup-truck form. Battelle’s press release says they’ll also be preparing Toyota Hilux and Ford Ranger pickups for military use, all of which will be designed to look like regular trucks. They’re no MRAPs, but the idea is to move personnel around quickly and quietly in areas that might not be too welcoming. The interactive image on Battelle’s site is a neat little tutorial of what’s done to the trucks and where. Military Aerospace explains that the vehicle concepts prepared by Battelle will go through a design-review process, then a physical testing process after the first batch is made, before going into active duty. If SOCOM likes what they see, they might spend the full $170 million over a potential five-year period for a full run of the vehicles. Battelle has apparently been armoring U.S. military vehicles since they worked on tanks in WWII, and more recently has helped augment Hummers for combat survivability. They should have even better luck now that they’re starting with a 4x4 platform that actually works!